Based on my own experience, I can tell you that my 2 AWAs run great. So does my Colt. Real Colts are usually prohibitively expensive, but mine was "restored" which made it very pretty, and ruined it's "collector" value to the point where I can afford it. I have handled a Taurus, and thought the action was like scraping 2 sheets of sandpaper together. Others here will tell you that they are very useful tomato stakes. I've never actually fired one, but that is the general consensus. I handled a Beretta once. Found it clunky. The prevailing opinion is that the Pedersoli is excellent. The USFA's which are as rare as hens teeth, also have a good rep here on the Wire. Never shot a Lighting so I can't help ya there. All of my revolvers are Uberties with no problems. USFA's are probably very expensive also. In SAA's, I've seen them sell for more than similar Colts but that's something I'll keep an eye on later!! 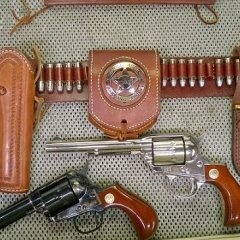 Jack, I have a Uberti Cattleman in 45 with the acp cylinder that is one of my favorites!! Had another in 44 special in a black powder frame, but gave it to my son. Nothing wrong with either one!! I loaded up a bunch with 6 gns of Trail Boss yesterday. Even after removing the baffle out of my Hornady powder dispenser the flakes would dam up so I used my digital scale dispenser and whipped em out! Anyway, I went with 6 gns because with the shorter OAL my crimper is making, I figured better not to have to worry about the pressure. Also, I tried the case fill and measure method from the Hogden website. Roughly figured the cases hold 8.6 gns loose up to where the bottom of my bullets would be. After multiplying by .7 it took it to 6 gns as a minimum load. But their website recipe is using a 1.600 OAL and a .430" bullet. So more to add to the confusion! I figured 6 grains to be safe enough till I speed check them. Maybe this week I can get a day to go to the range with my chrono and check out all these loads. Typical revolver pressures from 1937 Philip Sharpe, handloading manual were between 10,000 and 15,000[assume cup] . 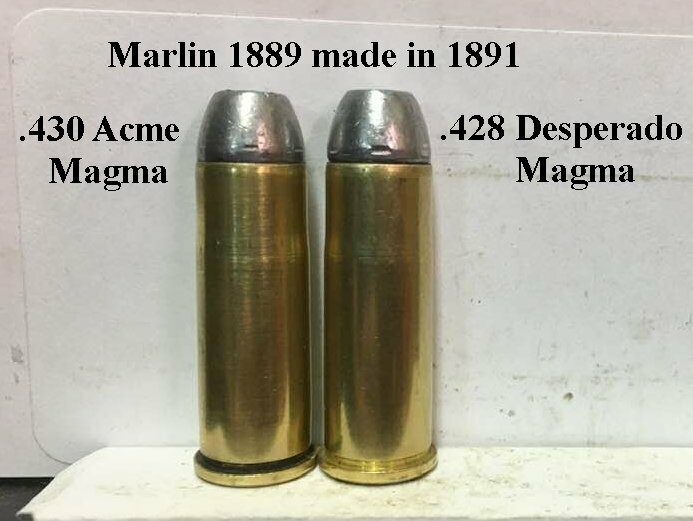 Interestingly between 14,000 and 33,000[assume cup] for rifles [assume Marlin and 92' types]. 8,500cup/7,000psi loads won't hurt a tic and probably won't even expand the case neck enough to seal the chamber in a rifle. Keep in mind, I normally load copper plated or jacketed bullets in most of my other loads, so I'm not the sharpest tack in the box when it comes to using lead bullets on any given load. And I have never fired lead bullets in any of my rifles yet. I've got to get the Lyman manual on casting and loading lead so I can get better educated and not sound so dumb asking what is probably elementary questions to most guys on this site! Hey, I am just a hillbilly from the Ozarks so it takes longer for me to absorb good information and flush out the bad!! The main difference between shooting lead bullets and jacketed bullets is generally speaking you want lead bullets to be .001 oversize of the rifling groove diameter, while you want jacketed bullets to be the same size as the rifling groove diameter. This is because lead is soft enough to conform to the rifling groove diameter, and copper jackets are harder, so you want them to fit the rifling groove more exactly. Also, jacketed bullets may not have a crimp groove, because they are usually used in semi-automatic pistols which head space on the case mouth. Because of this, many cartridges loaded with jacketed bullets will employ a taper crimp. Lead bullets usually do have a crimp groove because those cartridges usually head space on the rim.. HOWEVER........................I have several 44-40 rifles. Some have .427 diameter rifling grooves, some have .429 diameter rifling grooves. Years ago, before I got any of those rifles with .429 grooves, I shot .427 diameter lead bullets through them. The thing is, some rifles have tight chambers. With my old Uberti '73 with its tight chamber, I tried .427, .428, and .429 bullets. They all shot fine, but the tight chamber made cartridges with .429 bullets a bit tight to chamber. That is because the .429 bullets expanded the neck of the cartridge just enough to cause interference when chambering a round. So I settled on .427 bullets. No, they were not oversize, but everything was fine. These days I have compromised with .428 diameter bullets for everything, including my Henry with its .429 diameter rifling grooves. So yes, the bullets are technically .001 smaller than the rifling grooves, but they shoot fine. I suspect that since my bullets are very soft lead, they are bumping up in the bore to fill the grovves, but I don't have any proof of that. So .001 under rifling groove is working fine for me. Can't help you with copper plated, I have no experience with them. I like jacketed bullets myself. I have gained great accuracy with some jacketed bullets using Reloder 7. There are only two 44-40 jacketed bullets that I know of still manufactured or either still fairly obtainable, Winchester and Remington JSP and both are small diameters. Winchester is .4255 I think Remington is .426. I guess because of the smaller bores. Typically modern 44-40 bullets are only .427 - .428 with 44 Special @ .429 and 44 Magnum @ .430 pending who is speaking and if for revolver or rifle. 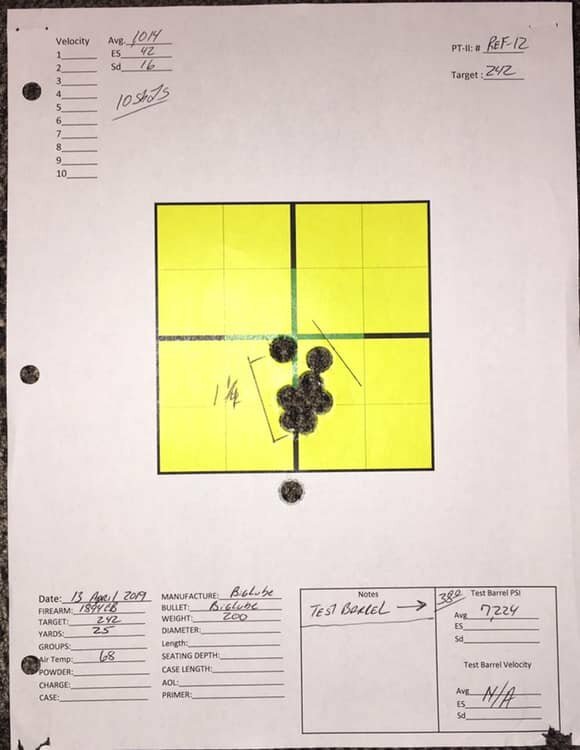 I have achieved 5" groups @ 100 yards with Reloder 7 in my .429 Marlin @1,278 fps with pressures near 10,000psi. With a hard Redding crimp, I have managed 1,400fps @ 11,000psi with decent groups as well. Your mileage and pressures may very! My Uberties can be finiky with thicker Remington brass and .429 jacketed bullets. Thanks again, Driftwood and Jack! Sounds like if I'm going to use lead bullets, I need to slug the bores and chambers of the Winchester and Colt. That will take alot of guess work out of it and I'll know what is correct. Then check on buying softer lead than what I'm using. Save what I have left in case I get a '92 or similar stronger action. The copper plated bullets I'm using are from Rainier (not sure if they make em in 44-40 range). I like them because you dont need to use lube and they are softer than FMJ and fairly cheap. No crimp groove in them either, but it's soft enough you make one as you crimp. They claim they are good for up to 1200 fps. After that the plating may start peeling from the pressure. Accuracy is good tho not as good as lead, but I can still hit a pie plate with my 1911 at 25 yards with them. Not great by most standards but good enough for me!! I really appreciate everyone taking the time to explain everything to me!! Like Driftwood, I use a .428" bullet for .44-40. (It is worth noting that for this game, you have to use lead bullets.) I've never checked to see what the actual bore diameter is on any of my guns, but I have a feeling that their is probably some variation. Other that the antiques getting black powder only, I run the same load and bullet in all of these guns. I know the Sheriff's and the Buntline have .429" bores since they were made for .44 Special. Accuracy, even from the snub nosed Sheriff's, is fine with the .428" bullet. 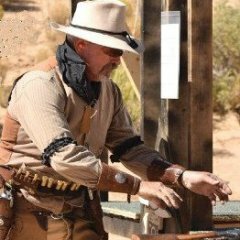 (.44 Special get's a .430) I remain convinced that fretting over what the actual bore size is in your .44-40 guns and then going and using different bullets for the different guns is not necessary. Besides, even if the bore is "oversized" the chamber might be too tight for the bigger bullets anyway, rendering it all a moot point. I've never really checked to see how hard or soft the lead is in my bullets. I just buy what I can find for a 200 grain Round Nose Flat Point of .428" caliber. The box always says "Hard cast." whatever that means, but I assume they are not really soft pure lead. Take it with a grain of salt. I do tend to over think stuff and sweat the small details to a point. I have just ordered some .428 LRNFP with a BHN of 10-12. So I will compare them to the BHN 16's I have already loaded for speed difference, accuracy and leading. I plan to load with velocities around 800 with pistol and 1000 with the rifle with just one recipe. I dont want to have loads for rifle only and loads for pistol only! That is unless I pick up another rifle in a stronger action! I haven't read all the rules of the game yet so I don't know about max velocities, caliber, bullet type, etc. yet. There is an 'Old West' club at my gun range but I don't know if they are SASS affiliated. When I finally go to one of their events, I'm sure I'll learn all the rules rather quickly!! My Marlin 1889 has a "short" chamber compared to my 1894CB and MGM barrel. Note the driving band marks on the forward driving band on the bullet. This will cause higher than normal chamber pressures. The left cartridge has an AOL of 1.582 and the right cartridge has an AOL of 1.594 with a bullet seating depth of .300 (slight gap in seating depth). Also the bullet on the right is a little softer alloy which could also increase chamber pressures. No worries with pressures with "mouse fart" cowboy loads such as my 6.4gr of Trail Boss (avg velocity from 1894CB 24" is 1,014fps). 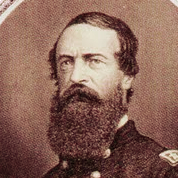 See attached target. This "Magma" design is not a typical 44-40 "profile" bullet. In other words, the Redding 44-40 Winchester "Profile" crimp die will not work with these bullets. I use the RCBS "Cowboy" seating die/roll crimp function. On the "Trail Boss" target....using "Big Lube" bullets, the low hole was my first shot. Yes, I was using my scoped 1894CB. The scope is set POA @ 265 yards with 1,700fps "Magma" bullet loads so I have to aim dang near three feet low @ 100 yards and I think it was nearly 12" low for thes 25 yard shots. I see your test barrel averaged 7,224 PSI. What would that be in CUP? If I remember, your Big Lube bullets are .427"? Did you measure the pressure with the larger and softer bullets? Having a test barrel must be a blast (pun intended)! So many different combinations of powder, crimp, bullet size and hardness, OAL to play with!! Still haven't made it to the range yet. It was flooded last week and I dont go on weekends, so hopefully this coming week I'll make it out there. I searched in all my stash's and couldn't find a pure lead ball the right size to slug the bores on my new guns. The smallest I found is a .442" so I'll hafta make a run to my local blackpowder shooter supply store and look for .430" give or take. Thanks again, Jack for all the information!! I searched in all my stash's and couldn't find a pure lead ball the right size to slug the bores on my new guns. The smallest I found is a .442"
That 0.442" soft lead ball is perfect to slug with. You will probably shave a bit of the lead off the ball as you start it down the barrel, but what you shave off is a small amount of the ball, and with it being soft that little bit will come off quite easily. If you have a muzzle loading ball starter, it makes a nice short safe rod with which to get the ball into the muzzle safely. If I recall I pressure tested .429 Magma bullets with the 6.4gr of Trail Boss but will have to check. That is why you se the test readings on the lower right of my targets,,,,it's used as a reference hence the Ref-12 (Reference test #12). Test 12 may have used different components than the actual target shots during that particular Group. I just couldn't test all combinations and that gives me an idea of what to expect. Yes, the 44-40 is very multifaceted and is why we all have our preferences. .442 SOFT is fine but you may have to do what seams highly unethical and pound hard to get it started. It will shave a "ring" off as it goes into the muzzle pending the size dowel/rod you use. The .442" ball did the trick! The bore on my new Miroku Winchester is .429". The bore on my 3rd Gen Colt was also .429" and the end (or throat) of the cylinder was .430. I was expecting alot of hammering but after it was in about 1/2" it fell thru till it got to the throat, then a gentle push with the cleaning rod got it out. I put a piece of wood on the ball and tapped it with a small hammer till the ball was flush then used my aluminum cleaning rod after that. On the Colt, I hammered it the same way to start then pushed the ball thru (the ball didn't fall thru like the rifle did). So a .430" lead bullet would work? Assuming it will fit in the throat of the rifle. There is a guy on the classifieds selling bullets that may work for you. This is my experience too. I tried the Lee collet die and set it aside, because my 44-40 takes .430 bullets, not .428, leaving the RCBS Cowboy doing the better job in my case. My gun is a Uberti 1875 Remington Outlaw with throats that demand .430 bullets. Most accurate gun for me. I use Lyman's load for 700-x. I tried the Lee FCD when they came out. It does crush cases and deform bullets. So I went back to the 1960's Lyman dies. They size the cases to fit in my 1st Gen 44WCF. Sizing down your bullets as you crimp them is not helping. I'm still waiting for the rain to quit so I can get my chrono out and try out my new guns and loads. It's at least a 45 minute drive to get to the range so I always plan on spending at least 4 or 5 hours when I go to make it worth the gas. The rain quit and I had a fun day at the range! Man that '73 Winchester is slick!! Love it!! I shot several loads using Unique, 2400, Trail Boss and some factory HSM Cowboy Action ammo. I chrono'd all of them thru my rifle but not the Colt. Out of all of them 2400 and Trail Boss were the best performers in regards to accuracy and recoil. I still have some more experimenting to do but it's a start!! I can post the data from the chronograph results if anyone is interested. I really appreciate all the help I got from everyone on this!! Welcome to the Realm of the 44-40!!!!! !